2) the Global War on Terrorism (GWOT) and its domestic counterpart, the National Security Enterprise, are entirely fraudulent enterprises designed to expand the profits of the military-industrial complex, among other objectives! Such naivete on the part of these authors is extraordinary, and may indicate that this book is somewhat of a “limited hangout,” to use the intelligence term. Otherwise, this book, the notes I extract from it (below), and the following related youtubes provide much excellent and essential background information. 1) Since 9/11, over $8 trillion of public money has been transferred from social programs to the National Security Enterprise (aka “Top Secret America”) (from Valentine, D. (2017). 2) Since 9/11: U.S. has spent over $6 trillion prosecuting foreign wars under the pretext of waging the Global War On (of) Terrorism. These wars primarily benefit Israel. 4) Journalist George Webb estimates that today there are over 20 times more undercover government agents operating than during the height of the Vietnam war when the FBIs COINTELPRO and CIA’s MHCHAOS operations were running and spying on Americans. II. What Institutions are Behind the Global Gestapo (GISTAPO-666)? CENTCOM (Central Command): A unified command of the Defense Dept., headquartered at MacDill AFB. CENTCOM manages US troops and military operations in the countries of the Middle East, North Africa, and Central Asia. Located in Tampa-St. Petersburg, Florida. CIPFIN (Defense Critical Infrastructure Program for Finance): A database and element of the Defense Critical Infrastructure Program that identifies and assesses the security of physical assets, cyber assets, and infrastructures in the public and private sectors that are essential to national security. DHS (Department of Homeland Security): Established by the Homeland Security Act of 2002, DHS came into existence on January, 24, 2003. It is in charge of developing and coordinating a comprehensive national strategy to strengthen the U.S. against terrorist threats and attacks. It includes the Transportation Safety Administration (TSA), Immigration and Customs Enforcement (formerly INS), FEMA (Federal Emergency Management Agency), the Coast Guard, Customs and Border Protection, and the U.S. Secret Service. Currently, there are 78 DHS Fusion Centers in the U.S. (2017 annual budget: $41 billion; number of employees: 230,000). Three main centers include Washington, D.C., Denver-Aurora, and Tampa-St. Petersburg, Florida. DIA (Defense Intelligence Agency): The largest product and manager of foreign military intelligence for the Department of Defense. It is one of sixteen members of the U.S. intelligence community. The DIA director is the primary adviser to the defense secretary and the chairman of the Joint Chiefs of Staff on military intelligence matters. It manages the Defense Attache program. Established in 1961 and headquartered in Bolling AFB in southeast Washington, DIA intelligence analysis through a network of air, ground, naval, missile, and space-related intelligence centers. It has a small HUMINT (human intelligence) section as well. Number of employees: 16,500 in 2010. DNI (Director of National Intelligence): A cabinet-level position, the DNI is a sort of intelligence czar whose role is to coordinate all the sixteen-agencies and departments that make up the intelligence community. The DNI is the principal adviser to the president and the National Security Council for intelligence matters related to national security. The DNI also oversees and directs the implementation of the National Intelligence Program (NIP). In reality, the power of the DNI has depended less on the definition given in the legislation than on the title holder’s relationship to the president and to the heads of the various intelligence agencies. At least 1,700 federal employees and 1,200 private contractors work at the Office of the DNI. DoD (Department of Defense): An executive department headed by the secretary of defense. The DoD is responsible for providing, organizing, and managing the military forces needed to prevent and fight wars and protect the security of the United States. The major elements of these forces are the army, the navy, the Marine Corps, and the air force, consisting of about 1.3 million men and women on active duty. They are backed, in case of emergency, by the 825,000 members of the reserves and National Guard. In addition, there are about 600,000 civilian employees in the DoD. (2019 annual budget: $717 billion). DOHA (Defense Office of Hearings and Appeals): A component of the Defense Legal Services Agency of the Defense Department that provides legal adjudication and claims decisions in personnel security clearance cases for contractor personnel doing classified work as well as for the Defense Department and twenty other federal agencies and departments. DPAO (Defense Policy Analysis Office): Runs J39 programs, Special Technical Operations (STOs), that include cybersabotage. FBI (Federal Bureau of Investigation): The primary federal law enforcement agency responsible for counterterrorism investigations and federal crimes within the United States. Its director holds a cabinet-level position. FISD (Federal Investigative Services Division): Carries out background investigations used by government agencies to determine individuals’ suitability for employment and security clearances. In 2005, the Defense Security Service transferred the DoD personnel security investigative function (and about sixteen hundred personnel) to FISD. Most of the major agencies of the intelligence community outside the DoD are responsible for their own security investigations and clearance programs. GAO (General Accounting Office): Established in 1921, GAO is an independent budget and accounting agency that works for Congress. GAO investigates how the federal government spends taxpayer dollars, and the head of the GAO is the comptroller general of the United States. GEOINT (Geospatial Intelligence): Consists of imagery, imagery intelligence, and geospatial (mapping, charting, and geodesy) information concerning the physical features of earth and underground. Prior to 9/11, the U.S. Geological Survey was responsible for producing imagery and geospatial data for the U.S.
IO (Information Operations): Information operations, sometimes called influence operations, are primarily engaged in influencing foreign perceptions and decision making. During armed conflict, they also include efforts to achieve physical and psychological results in support of military operations. Military IO includes psychological operations (PSYOP), military deception, and operations security (OPSEC), which are measures to protect the security of the U.S. operations and information and further their goals. Military information warfare operations centered in San Antonio, TX. JCITA (Joint Counterintelligence Training Academy): Located in Elkridge, Maryland, JCITA is the primary training organization specializing in advanced counterintelligence. Established in 2000, it is a part of the Defense Intelligence Agency. JCITA provides training to over ten thousand military and defense agency personnel around the world through in-residence, mobile training, and distance learning. JSOC (Joint Special Operations Command): JSOC was created in 1980 as a hostage rescue force. It was revamped by army general Stanley McChrystal in 2003 to become a proficient offensive military force engaged largely in killing and capturing top terrorist leaders in Iraq, Afghanistan, the Philippines, Yemen, and elsewhere. JTAC (Joint Terminal Attack Controller): Air Force personnel on the ground helping to guide pilots in the air to hit their targets. JTTF (Joint Terrorism Task Force): Under the direction of the FBI, a JTTF brings together federal, military, state, and local law enforcement entities to investigate, analyze, and develop sources on terrorism within the United States. From 35 on 9/11 – the first was established in New York City in 1980- the number of JTTFs grew to 106 by 2011. The largest, in New York, Washington, and Los Angeles, include hundreds of employees and liaison officers from other agencies; the smallest are no larger than a dozen or so people. Over 5,000 agents and analysts are involved daily. NCTC (National Counterterrorism Center): Established by the Intelligence Reform and Terrorism Prevention Act of 2004, NCTC integrates and analyzes all intelligence on terrorism and counterterrorism and designs strategic counterterrorism plans. It is a subordinate organization of the Office of the Director of National Intelligence. It maintains Terrorist Screening Database (TSDB), an authoritative list fed by two primary sources: international terrorist information from NCTC and domestic terrorist information from the FBI. 2010 budget of $80 billion a year, which did not include all the military’s spending on counterterrorism and intelligence. NGA (National Geospatial-Intelligence Agency): A Department of Defense combat support agency that provides geospatial intelligence in support of national security. NGA also develops imagery and map-based intelligence solutions for US national defense, homeland security, and safety navigation. Headquartered in Bethesda, Maryland, NGO has major facilities in Washington, northern Virginia, St. Louis, and Arnold, MO. NIEs (National Intelligence Estimates): Produced by the interagency National Intelligence Council (located at CIA headquarters in Langley, VA), NIE’s are the authoritative overall future assessments of the intelligence community, usually produced at the top secret classification level. Subjects can range from projections of Russian and Chinese nuclear forces to the national security impact of climate change. NIMA (National Imagery and Mapping Agency): Renamed the National Geospatial-Intelligence Agency in 2003). NORAD (North American Aerospace Defense Command): A U.S.-Canadian military organization charged with warning of attacks against the United States from missiles, aircraft, or spacecraft. It controls airspace over North America. The commander is responsible to both the U.S. president and the Canadian prime minister. NORTHCOM (Northern Command): Established on October 1, 2002, attacks and based in Denver-Aurora, Colorado, Northcom is supposed to be in charge of the Defense Department’s homeland defense efforts and the coordination of defense support to civil authorities when requested. It operates in U.S., Canada, and Mexico and keeps the Cheyenne Mountain underground bunker on standby. Employs 18 generals and admirals along with 11 generals from the reserves and National Guard. Staff of 3,000 includes hundreds of contractors, lawyers, and intelligence officers in subordinate air, army, and navy commands. NRO (National Reconnaissance Office): The NRO was established in September 1961 as a classified agency of the Department of Defense and declassified only in 1992. Headquartered in Chantilly, Virginia, NRO manages the design and construction of the nation’s reconnaissance satellites, which are the main collection assets for geospatial intelligence source data. Most of its activities are undertaken by contractors. ONI (Office of Naval Intelligence): The navy’s lead intelligence center, it is headquartered at the National Maritime Intelligence Center (NMIC) in Suitland, Maryland. It produces maritime intelligence and analyzes and assesses foreign naval capabilities, trends, operations, and tactics, global civil maritime activity, and an extensive array of all-source analytical products. OPSEC (Operation Security): Measures taken to prevent documents, technology, and plans from being disclosed to unauthorized personnel. OSD (Office of the Secretary of Defense): The OSD formulates general defense policy and policy related to the DoD. It is organized primarily through a set of undersecretaries: undersecretary for acquisition, technology, and logistics; undersecretary for intelligence; undersecretary for personnel and readiness; and undersecretary for policy. SECDEF (Secretary of Defense): Under the president, who is commander in chief, the defense secretary exercises authority and control over the Department of Defense. The department in composed of the Office of the Secretary of Defense; the military departments and the military services within those departments; the chairman of the Joint Chiefs of Staff and the Joint Staff; the combatant commands; the defense agencies; DoD field activities; and such other offices, agencies, activities, and commands as may be established or designated by law or by the president or the defense secretary. SOCOM (Special Operations Command): SOCOM was activated on April 16, 1987, in response to congressional action in the Goldwater-Nichols Defense Reorganization Act of 1986 and the Nunn-Cohen Amendments to the National Defense Authorization Act of 1987. Congress mandated a new four-star command to prepare special operations (SOF) to carry out assigned missions and, if directed by the president or the secretary of defense, to plan for and conduct special operations. Located in Tampa-St. Petersburg, Florida and San Antonio, TX (headquarters of military information warfare and air force intelligence). SOF (Special Operations Forces): A term used to describe elite military units proficient in counterinsurgency, training foreign military forces, civil affairs, and psychological operations;. They are more highly qualified, both physically and mentally, and better equipped than conventional forces. They operate in small teams and are made up of the army’s Special Forces; otherwise known as Green Berets; U.S. Navy SEALs; and the air force’s special operations airmen. SPACECOM (Space Command): Established in 1984 and shut down in 1992, SPACECOM was previously one of the unified joint commands with functional rather than geographic responsibilities- military operations, weapons, exercises, plans, and strategy related to space. Headquartered at Peterson AFB, its commander was “triple-hatted,” serving also as commander in chief, North American Air Defense Commend, and commander, Air Force Space Command. TOSA (Technical Operations Support Activity): A clandestine intelligence, surveillance, and reconnaissance (ISR) organization that supports special operations, JSOC, and other short-term intelligence collection efforts that demand close-in presence. Formerly known as the Intelligence Support Activity, the Activity, and Grey Fox. USD(I) (Undersecretary of Defense for Intelligence): This individual serves as the principal staff assistant and adviser to the defense secretary and the deputy defense secretary on all military intelligence, counterintelligence, security, and other intelligence-related matters. The USD(I) provides oversight and policy guidance for all DoD intelligence activities, but also manages a few select operations. See DPAO, chapter 4. United States Cyber Command (USCYBERCOM): One of ten unified commands of the U.S. Department of Defense. It unifies the direction of cyberspace operations, strengthens DoD cyberspace capabilities, and integrates and bolsters DoD’s cyber expertise. USCYBERCOM was created in mid-2009 at the National Security Agency (NSA) headquarters in Fort George G. Meade, Maryland. It cooperates with NSA networks and has been concurrently headed by the Director of the National Security Agency since its inception.While originally created with a defensive mission in mind, it has increasingly been viewed as an offensive force. On 18 August 2017, it was announced that USCYBERCOM would be elevated to the status of a full and independent unified combatant command. This elevation occurred on 4 May 2018. CIA’s Greystone (covert action program): includes post 9/11 detention, interrogation, and rendition programs, and all the required logistics, from airplanes used to fly detainees around the world to fake names for the secret prisons overseas where detainees were kept in isolation, sometimes for years. Was conducted in Afghanistan, Pakistan, Indonesia, Malaysia, Thailand, the Philippines, Uzbekistan, Somalia, Germany, France, Italy, Kosovo, and Macedonia…. (ETK- and America, probably)….. Covert CIA prisons, the so-called “black sites,” also reside deep in a compartment never to be found. Republished from The Washington Post. The top-secret world the government created in response to the terrorist attacks of Sept. 11, 2001, has become so large, so unwieldy and so secretive that no one knows how much money it costs, how many people it employs, how many programs exist within it or exactly how many agencies do the same work. These are some of the findings of a two-year investigation by The Washington Post that discovered what amounts to an alternative geography of the United States, a Top Secret America hidden from public view and lacking in thorough oversight. After nine years of unprecedented spending and growth, the result is that the system put in place to keep the United States safe is so massive that its effectiveness is impossible to determine. Watch the intro video at The Washington Post . . .
Read the article . . . Interact with the map . . . This entry was posted on Monday, July 19th, 2010 at 7:00 am	and is filed under Flash, General, Geography, Google Map Mashup, Interactive, Mapping, Maps in the Wild, Mashup, Self promo. You can follow any responses to this entry through the RSS 2.0 feed. Both comments and pings are currently closed. The Washington Post has used the Google Maps API to map the rise of domestic counter-terrorism organizations in the United States since 9/11. 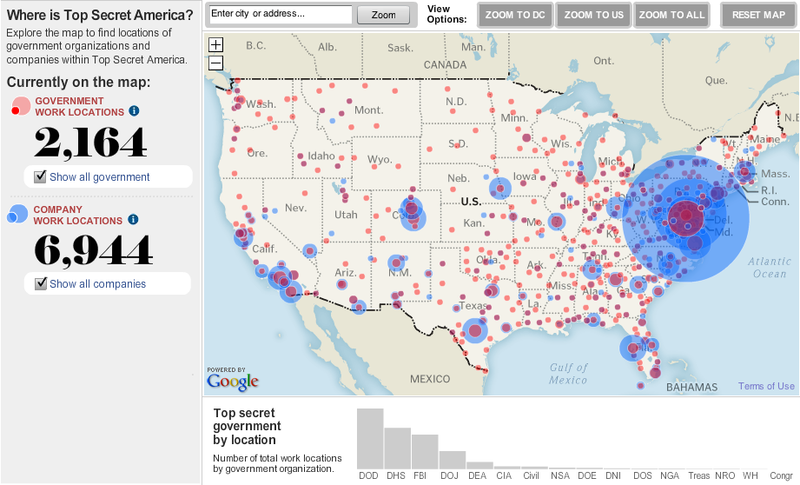 The Top Secret America map allows users to search for counter-terrorism organizations by address, by the type of organization, by jurisdiction and by whether the organization was established before or after 9/11. A bar chart beneath the map also shows the number of organizations established in each state. The map shows both government organizations and private-sector companies that do domestic counter-terrorism and top-secret work. Copyright © 2019 Gang Stalking, Mind Control, and Cults All Rights Reserved.